In x-ray diffraction work we normally distinguish between single crystal and polycrystalline or powder applications. The single crystal sample is a perfect (all unit cells aligned in a perfect extended pattern) crystal with a cross section of about 0.3 mm. The single crystal diffractometer and associated computer package is used mainly to elucidate the molecular structure of novel compounds, either natural products or man made molecules. Powder diffraction is mainly used for “finger print identification” of various solid materials, e.g. asbestos, quartz. In powder or polycrystalline diffraction it is important to have a sample with a smooth plane surface. If possible, we normally grind the sample down to particles of about 0.002 mm to 0.005 mm cross section. The ideal sample is homogeneous and the crystallites are randomly distributed. 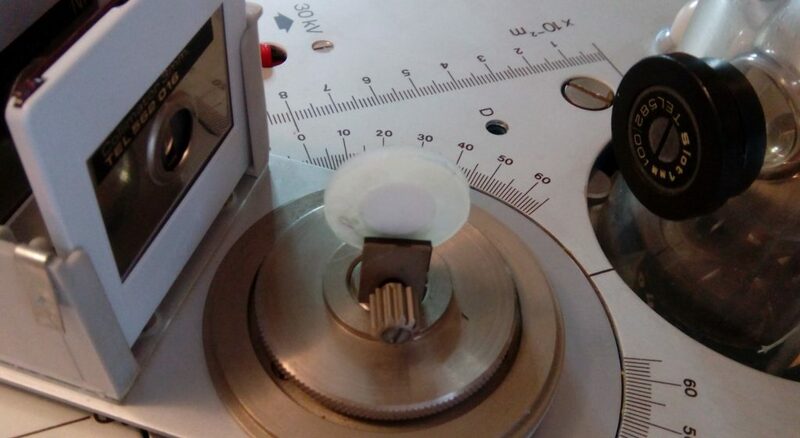 The sample is pressed into a sample holder so that we have a smooth flat surface. Ideally we now have a random distribution of all possible h, k, l planes. Only crystallites having reflecting planes (h, k, l) parallel to the specimen surface will contribute to the reflected intensities. If we have a truly random sample, each possible reflection from a given set of h, k, l planes will have an equal number of crystallites contributing to it. We only have to rock the sample through the glancing angle THETA in order to produce all possible reflections. The mechanical assembly that makes up the sample holder, detector arm and associated gearing is referred to as goniometer. The working principle of a Bragg-Brentano parafocusing (if the sample was curved on the focusing circle we would have a focusing system) reflection goniometer is shown in the top image. 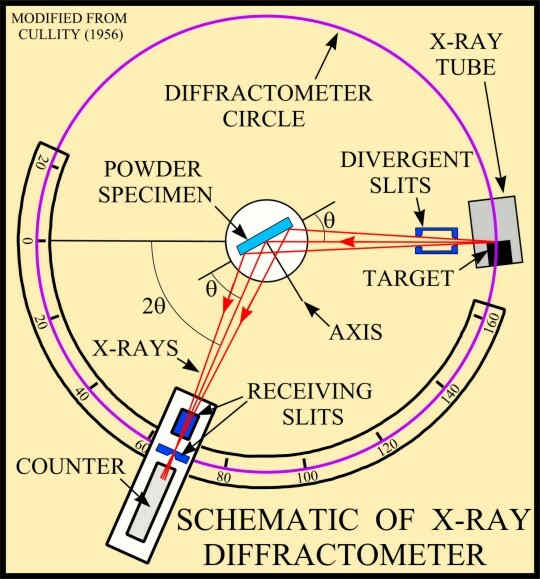 The distance from the x-ray focal spot to the sample is the same as from the sample to the detector. 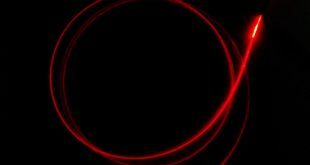 If we drive the sample holder and the detector in a 1:2 relationship, the reflected (diffracted) beam will stay focused on the circle of constant radius. The detector moves on this circle. For the THETA:2-THETA goniometer, the x-ray tube is stationary, the sample moves by the angle THETA and the detector simultaneously moves by the angle 2-THETA. Our diffractometer, the Teltron apparatus Tel-X-Ometer Equipment, was not designed for powders XRD and its power is rather small, despite these limitations we manage to perform some interesting diffraction experiments on powders samples. First of all we had to increment the current of the x-ray tube in order to increment the x-ray intensity. The x-ray tube is rated for a maximum anodic current of 100 μA, but this is not enough to achieve powder XRD because the signals from the powder samples are rather weak. Usually there are only few crystallites in the right orientation and the sample surface is not perfectly flat. For these reasons we had to increment the current til 250 μA. This is quite critical and the tube must be monitored to prevent it from becoming too hot and to avoid the filament burning. The second problem is the sample. In the Teltron equipment the sample must be held vertically causing the powder to fall down. We solved this problem using a simple plastic washer, closed in the back side with duct tape, and filled with the powder mixed with paraffin oil. This sort of pasty sticks to the washer and prevent the powder from falling down. 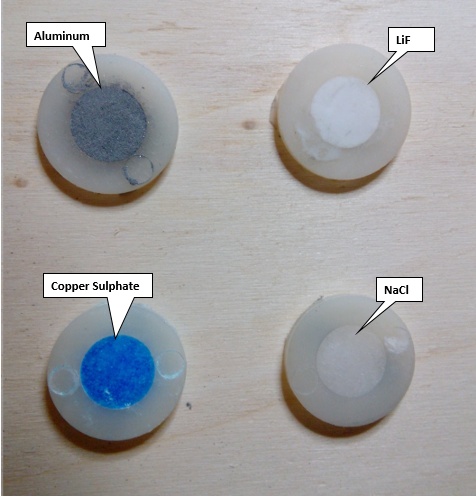 In the image below we show the samples of Aluminum, Lithium Fluoride (LiF), Sodium Chloride (NaCl) and Copper Sulphate. 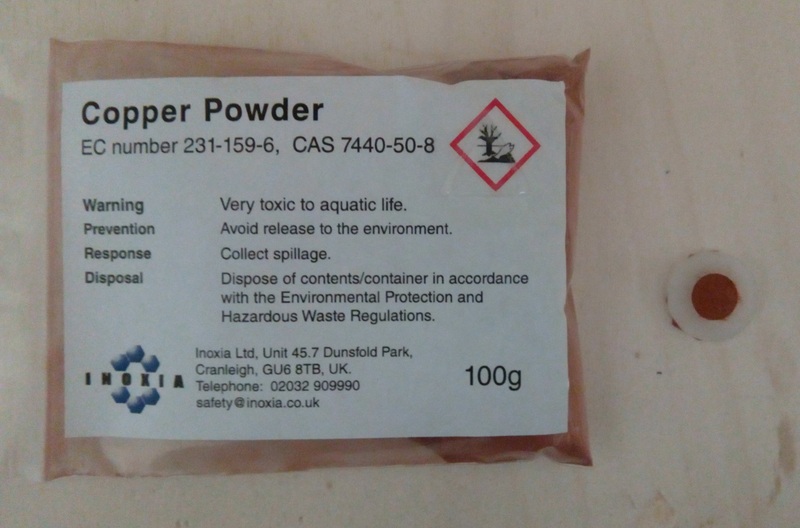 In the image below we show the copper powder and its sample. In the image below we show a powder sample during measurement. In the charts below we show the measurement results for Aluminum powder, Copper powder, Lithium Fluoride powder and Sodium Chloride powder. All of these materials have fcc crystal so the correspondent peaks are 111, 200 and 220 (with different intensity). All the peaks are, more or less, present in the graphs so the results are quite good even if the spatial resolution is not so high.